We were thrilled last spring when we heard that our Niece would be attending a great college nearby this year. It has been so much fun to have her over for dinner, and do laundry of course But also to lend a sympathic ear, and give advice and support when needed. This week she spent a few days with us, before setting off on an humanitarian trip to Haiti. Of course the Mom and cook in me needs to send her off with a tummy full of comfort food. So I ask her , what would you like to eat for dinner tonight more than anything?. What a nice polite child! So I quiz her a bit more, seeing that she has just spent the last 9 months eating cafeteria food, and we all know how bad college food can be. Maybe she is craving something her Mother always makes. Okay how about something Asian, maybe ginger salmon, probably not going to be eating that for the next few weeks huh?”. We eat a lot of fish and shellfish, with a vegetarian in the house and all. Then I remembered her Mother is allergic to fish and shellfish. So it was never an option in her house. So we decide to stay with the Asian theme, sesame crusted chicken fingers with a peanut dipping sauce for her, and salmon for us. Perfect. With that some sticky rice and soy beans. And lets not forget a side of kimchi (Korean pickled cabbage), I always have a big jar in the fridge. During dinner Kailey is munching happily on her chicken fingers and I see her eyeing my salmon, so I ask her if she wants to try a tiny piece of the fish? Sure enough she is game, and tries a teeny tiny piece. Then a bigger piece…. Then asks “Is it okay if I take that piece there on the platter?” Turns out she loves it. Sigh, her Mother would be proud. Preheat oven to 375 degrees with oven rack set in middle. In small bowl mix together dijon, soy sauce, garlic and grated ginger. 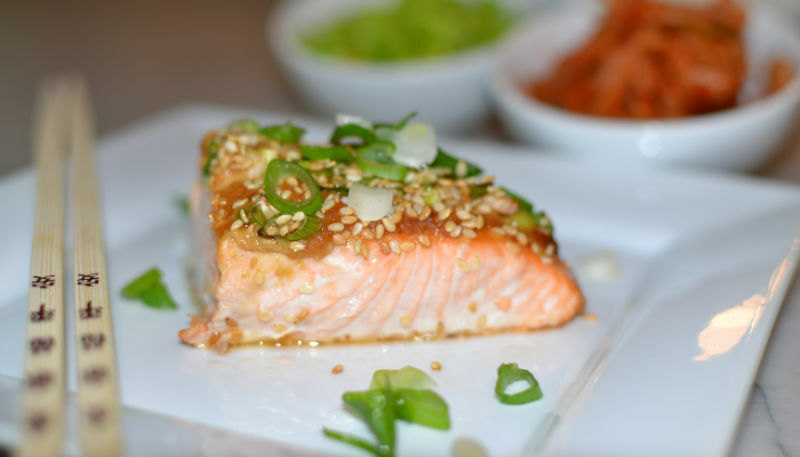 Spread over salmon, top with scallions and sprinkle with seseme seeds. Bake 15-20 mins, until flakes easily with fork. Serve with rice, steamed soy beans and kimchee.